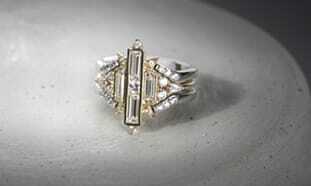 Simply put, mined diamonds do not jive with what we believe engagement rings (and other meaningful jewelry) should be. Engagement rings, and particularly custom-designed ones, are full of meaning and promise. The mined diamond industry tells people that diamonds are romantic because they are forever. While it is a lovely sentiment, they left out part of the story. And to us, it’s a big part. Diamonds can be mined under horrific labor conditions. Sometimes the miners are children. Usually, the mining practices destroy the environment surrounding the mine. Nearly 90% of brides-to-be prefer a diamond for their engagement ring. And we think you should get exactly what you want. That’s why we only offer manmade stones in the rings and jewelry we design. If a pure-carbon diamond is important to you, we have True Grown Diamonds™ that are precisely the same as what is pulled from the earth—without the shady past. We also use Contemporary Nexus Diamonds™ in our jewelry and engagement rings. These are the world’s one and only heirloom-quality diamond simulant. That means that you won’t be able to tell the difference between a Nexus Diamond and a flawless, colorless mined diamond. And since Nexus Diamonds cost much less than pure-carbon diamonds, you can get a large stone, or a more ornate setting. Whatever you’re imagining, you can have it without compromising on your vision. We’re not willing to compromise on quality, craftsmanship or the ethics of where our stones come from. So you don’t have to, either. And that makes the meaning infused in each engagement ring even more pure, beautiful and enduring. And that's why I love Diamond Nexus!